We’re excited to share details about our schedule for PAX East this year! If you’ve joined us at the BioWare Base in years past, you’ll know that you can find us upstairs above the exhibit hall in room 206AB. If you haven’t joined us previously, we can’t wait to see you! 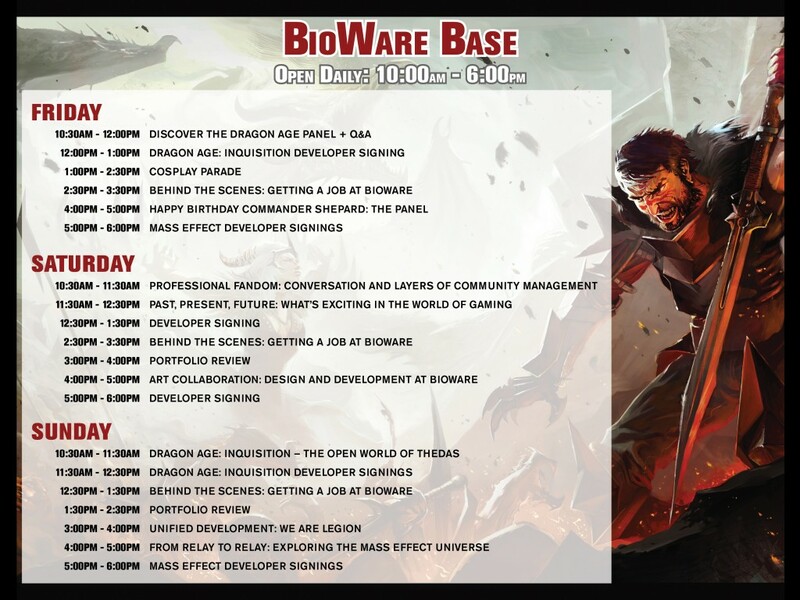 We’re holding weekend long panels about Mass Effect & Dragon Age as well as behind-the-scenes looks at game development, developer signings, plus representatives from EA University/Human Resources will be on site to discuss tips about breaking into the gaming industry! If you have a portfolio of any kind, please bring it as we have set aside time for our developers to review and discuss with you. We’ll also be celebrating Commander Shepard’s -140th birthday, which falls on the first day of PAX so please join us for a special panel to commemorate the day! And we are bringing back our tradition of hosting a Cosplay Parade on Friday at the BioWare Base. All cosplayers are welcome to join us for an afternoon of fandom with on-the-spot totally made up awards given to each and every cosplayer who comes (as well as physical swag, while supplies last!). The BioWare Base will also be joined by the delight and infectiously fun Snap Yourself photo booth daily from 11:00 – 3:00pm so be sure to immortalize yourself in front of our Mass Effect or Dragon Age backdrops. Last but certainly not least, we’ve partnered with Lone Shark Games to kickstart our convention year with an interactive twist to the BioWare Base. Please stop by throughout the weekend to join us for the Dragon Egg Hunt. Sound intriguing? Come to the Base to see what it’s all about! And if you aren’t able to join at PAX East, perhaps keep an eye out on our social media channels for some lost eggs!